SEATTLE, WA – The First Tee of Greater Seattle invites the community to a complimentary clinic and lunch on Wednesday, Aug. 14 at Jefferson Park Golf Course featuring Distinguished Service Award winner and honorary PGA member Dennis Walters. The Dennis Walters Golf Show began after an accident in1974 that left Walters, an aspiring professional golfer, paralyzed from the waist down. Nearly 40 years later he continues to play golf from a swivel seat mounted on the passenger side of a golf cart. Walters has made more than 3,000 appearances across the United States and internationally. Walters’ show emphasizes participation by audiences of all ages and includes golf and life lessons, prizes and a Q&A session. A highlight of the show is Walters’ trick shot demonstration featuring a shot while blindfolded, the 200-yard putt, precision shots with unique clubs and a rapid-fire machine gun shot. The hour-long clinic begins at 11 a.m. followed by a lunch provided by Jersey Mike’s Subs. 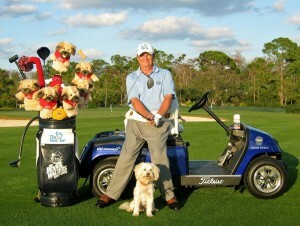 Pre-registration is required and may be made online subject to space availability at: www.TheFirstTeeSeattle.org. Jefferson Park Golf Course is located at 4101 Beacon Ave S. in Seattle’s Beacon Hill neighborhood, just minutes south of downtown. The course is maintained by the City of Seattle and managed by Premier Golf Centers LLC. The First Tee is an international youth development organization introducing the game of golf and its inherent values to young people. The First Tee of Greater Seattle became the 106th chapter of The First Tee on December 20, 2002. The research-proven programs aim to impact participants, their families and their communities positively.